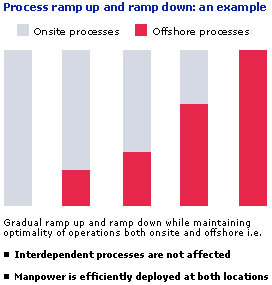 Access’ structured approach to outsourcing helps us assess, analyze and arrive at the optimal outsourcing solution. Our credibility, built on a consistent track record of solid execution has provided us with a clear differentiation in the market place. The Discovery phase of the engagement involves aggregation and understanding the client's processes, identifying the processes that can be outsourced, articulating the risk around these processes and developing a business case for the client. Transition is the process of migrating knowledge, systems and operating capabilities. It typically follows identification of appropriate processes and vendor selection. Parallel run helps achieve robust and tested operations, operational with all resources and infrastructure to execute steady state operations. 'Steady state operations’ is the on-going delivery of services. It also encompasses continuous process improvements in collaboration with the client. Establishment of "Business as usual" for the client, where the outsourced processes are executed as per norms laid down in the Service Level Agreement (SLA).